The Virginia Council of Teachers of Mathematics is an organization for ALL mathematics teachers in Virginia, from Elementary through College, from public or private, from pre-service to veteran. If you are not currently a member, please consider joining today! If you are a member, use this site to access our journal, find resources from past conferences, and apply for grants and other awards. Select the icon at the top of the page to log-in or access your profile. VCTM has been hard at work this summer making plans to support all mathematics educators. We have grant opportunities, scholarships, an AWARD-WINNING journal, newsletters, and are getting all of the details ready for the 2019 Conference. We hope this is the best year ever! The full program for our conference is now available by clicking this link. Hope to see you at Longwood! Catalyzing Change in High School Mathematics Task Force and Writing Team. Details about this event can be found on the conferences and PD page. Please note: All proposals that were received were notified about the status of their application on January 11. Thanks to everyone who submitted a proposal! The 2019 Math Beauty Contest is now open! Go to the Beauty Contest Page for official rules and to download this year's problems. Did you know that Washington, DC is the host of the 2019 National Math Festival? This incredible festival and its many free, fun, and surprising activities are just months away! The event is even more special when you come not just with family, but with friends, too! So be a multiplier, not a divider — and share your plans to attend on your favorite social media platforms. Remember, more friends attending = more fun! Mark your calendars for May 4, 2019, and go to www.nationalmathfestival.org for more information. Let's see if we can get a strong contingent from VCTM attending! Applications are now being accepted for the Edward A Anderson Scholarship. This scholarship is awarded to a college student pursuing a career in teaching mathematics. For more information and to download the application form, go here. If you are already a VCTM member, thank you! If you are not currently a member, please think about joining today! 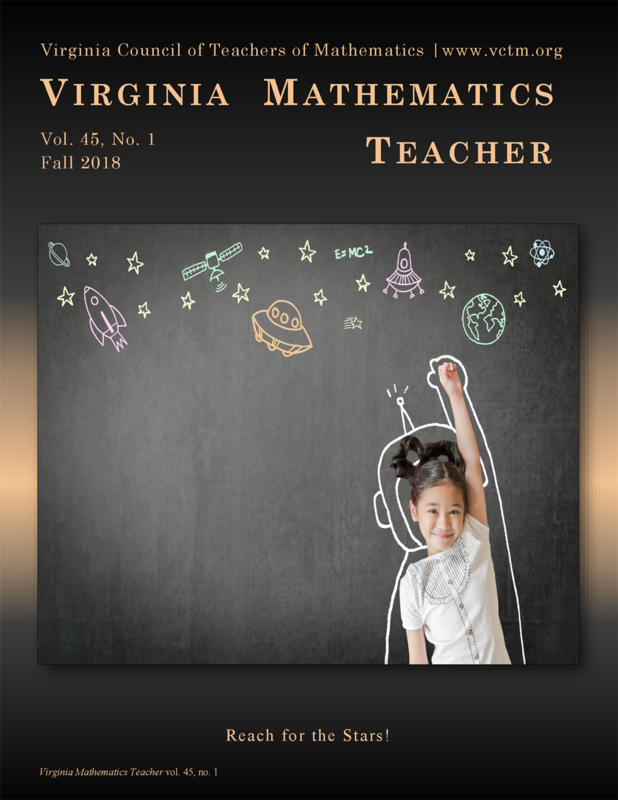 Have online access to back issues of the Virginia Mathematics Teacher and more! For more details or to join, click the membership tab in the menu, or just click here. We are always looking for members who want to get more involved in helping us be the best organization we can possibly be. There are lots of volunteer opportunities available from helping at our conference, to reviewing grant applications, to chairing a committee, to running for a position on the executive board. To let us know of any areas where you would be able to help out, access your profile, select edit profile, and then scroll down to see the variety of volunteer opportunities we have available. Check a few boxes and click submit. VCTM provides several grants for Virginia's mathematics educators. Select Grants and Scholarships from the menu to learn more. Most of these are only available to current VCTM members--one more reason to join us today! Flanagan Innovation Grant: This $5,000 grant is designed to support educators who wish to create a meaningful, innovative project to enhance mathematics instruction. Karen Dee Michalowicz 1st Timers Grant: These grants are designed to support attendance at an upcoming NCTM or VCTM conference. reimbursement for mathematics education courses, or other professional development opportunities. Applications are accepted on a continual basis. Congratulations to our 2018-2019 Flanagan Innovation Grant Winner! Click to read more about Jay Bradley's project. VCTM seeks to award two scholarships to undergraduate students studying to becoming a mathematics teacher. Select Grants and Scholarships from the menu to learn more. Our Fall 2018 journal is available online. Members can download the full journal. Non-members can get a free preview of selected articles. Members can also read back issues of the Virginia Mathematics Teacher by selecting Journal from the menu. Not a member? Join today! Each year, VCTM awards the Educator of the Year to a teacher at each of the following levels: elementary, middle, high, math specialist, university. To learn more about the award or see our past winners, select Awards and Contests from the menu. VCTM is proud to sponsor the mathematics beauty contest for teachers. Each spring, we pose problems for a variety of grade bands that promote problem solving. Learn about the contest or see past winners by visiting the math beauty contest page. VCTM's local affiliate groups are hard at work planning their professional development events and conferences. Learn more about these events on our affiliates page. Affiliates should also consider applying for our Affiliate Grant, designed to help grow membership in your local organization. Please send any updates, suggestions, or comments to the webmaster at vctmath@gmail.com. Virginia Council of Teachers of Mathematics is a 501(c)3 non-profit organization.